Last Friday I kicked off December in the best way possible by going to see Steps live at their ‘Party on the Dancefloor Tour’. 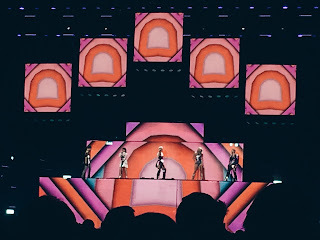 I was so, so excited about this concert because Steps were my entire childhood, I used to know all their songs off by heart when I was little! Every night I used to put on a CD as I went to sleep and a lot of the time it was Steps’ Gold Greatest Hits CD, so all of these songs just bring me right back to my childhood when I hear them and I adore them so much. The band also brought out a new album this year when they reformed for their 20th anniversary and the songs on it were also absolute bangers, so I knew that this show was going to be so much fun. We arrived at the venue pretty early after having dinner first, mostly just because we didn’t want to spend any more time out in the cold! That meant we had to wait a while but before long the first support act came on. I can’t for the life of me remember his name and I can’t even find it out by scouring google, sorry whoever you were! He was alright but didn’t really get the crowd hyped up, obviously he wasn’t very memorable if I can’t even find out his name! The next support act was the Vengaboys and oh my god, were they AMAZING. Hands down the best support act I’ve ever seen! I mean, their songs were full-on cheesy, but they were magical and got the crowd so hyped up, I’ve never seen a support act get as good a reaction as they did. They sang such delights as ‘Boom Boom Boom Boom’, ‘We’re Going to Ibiza’ and the old favourite ‘We Like To Party’, all three of which took me right back to the good old days of primary school discos. Everyone was singing and dancing along, up on their feet and already having the time of their lives before Steps even came on the stage which is completely insane for me, I’ve never seen anything like it for a support act and I doubt I ever will again, it was so iconic! After that I felt even more buzzed for Steps to come on, and surprisingly it wasn’t long until the lights went down again and a video started playing on the screen of some dark figures in red hoods. Suddenly everyone was looking around and I noticed that the red hooded figures were coming up each of the three aisles towards the stage, carrying long torches of fire, which was really cool. Once the mysterious figures had reached the stage they were joined by Steps and they burst into the first song, ‘Scared of the Dark’, which was the first single off their comeback album. I thought this was a great opening song choice because everybody knows it and also the build up to it was really original and creative. Next they performed two old classics in a row, ‘Deeper Shade of Blue’ and ‘Chain Reaction’, both of which prompted the most excited reaction from me I think I’ve ever had at a concert (and that’s a very hard thing to achieve, given the amount of concerts I’ve been to)! 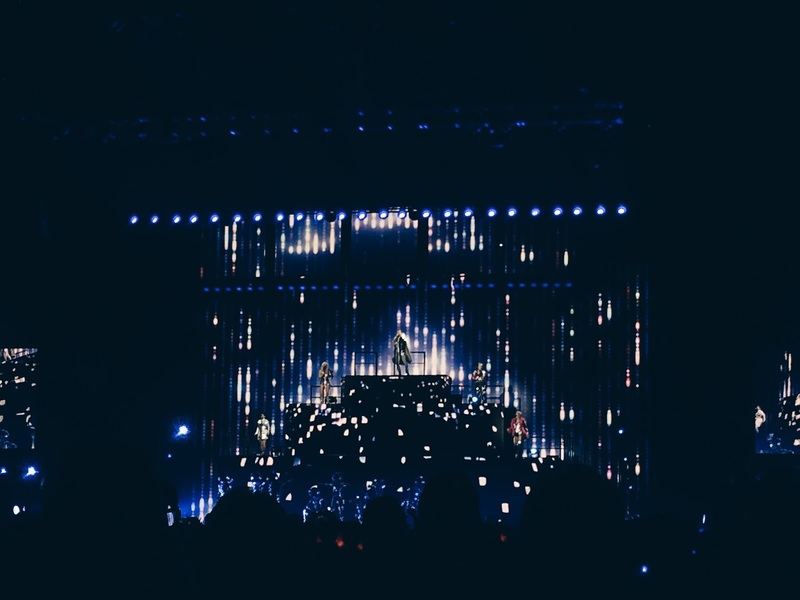 Hearing the songs I used to listen to religiously as a kid took me right back to that feeling of dancing around my bedroom without a care in the world and even though that sounds super cringy it made me SO happy to be singing and dancing along to all those childhood songs with so many other people who also still knew every word off by heart! I was even more excited when after one of their recent songs, ‘Happy’, they sang my ultimate favourite song of theirs ever, ‘Stomp’. You should’ve seen how much I screamed when the intro to the song came on. I don’t think I’ve ever sang along to a song live more loudly, I could literally feel my voice breaking as I shouted the lyrics. I used to absolutely adore this song when I was little, it always made me want to dance around and made me so happy so being able to finally hear it live all these years later just made me forget about everything else and go into my own little happy bubble, it was honestly the best thing ever! 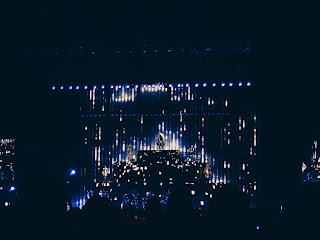 What I loved about the show was that they did the perfect mix of new and old songs, which was what I was really hoping they would do. They did quite a few mash-ups of different songs, one of my favourites being ‘Better Best Forgotten’ and ‘Last Thing on My Mind’ because these were also two of my favourite childhood songs and so hearing both of them follow on from one another was amazing, and again I screamed out the lyrics like there was no tomorrow. Another incredible mash-up they did was ‘Summer of Love’ (again, one of my favourite classic Steps songs, no surprise there). They had a really cool Mexican theme going on with the colourful day of the dead style skull images going on the screen, and halfway through the song they started singing ‘Despacito’ in with it which was such a clever and cool idea. 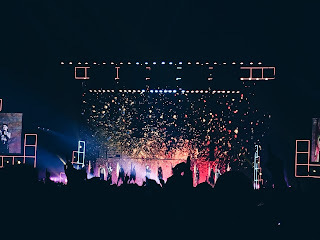 The staging for this was so fun and colourful and at the end of the song, the big screen went black and the words ‘love wins’ in rainbow colours appeared on it which was such a lovely message to finish off what was such a fun and energetic song. Not only did they perform a mixture of old and new songs, they also had a perfect balance between upbeat and slower songs. 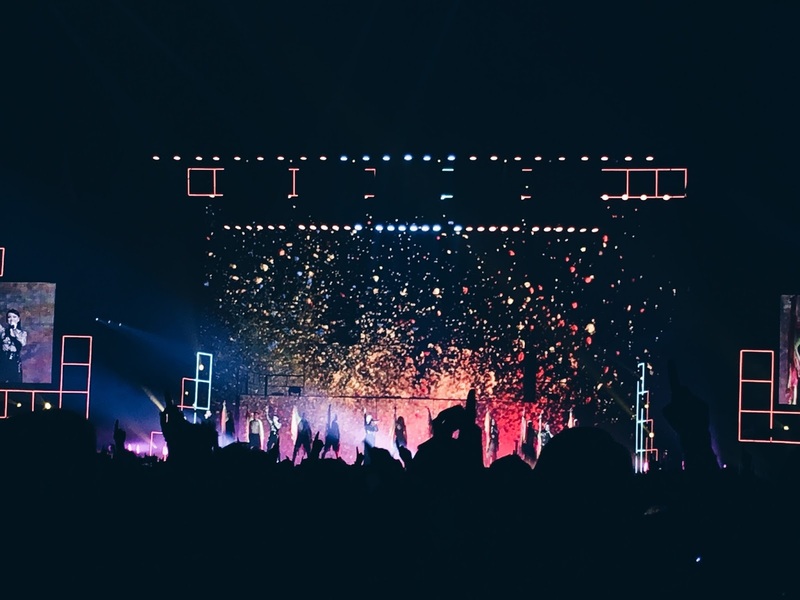 I always say that I love a bit of variety in concerts, and as much as I absolutely adore screaming along with the upbeat songs, dancing and jumping along and having the time of my life, I also like to slow it down sometimes and have a bit of an arm wave along to the more mellow songs. I was rewarded with this when they sang ‘When I Said Goodbye’ along to a sea of phone flashlights, which was so beautiful and was also a chance for the band to show off their amazing vocals. Yes, it may surprise some people but I was blown away by how incredible all their voices actually were. They may be known for upbeat cheesy hits at the school disco but their slower, ballad-type songs also deserve a lot of credit. 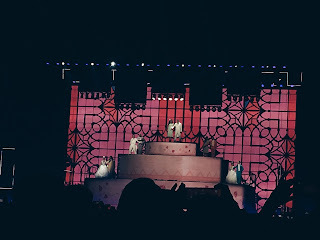 Other slower-paced highlights were ‘It’s the Way you Make Me Feel’, which gave me flashbacks to when I used to sing it dramatically into my flower power microphone, pretending that I fully understood the heartbreak and emotion in the song at age 8. Ah, the good old days. 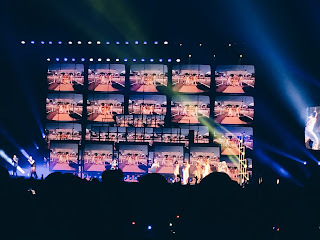 Also, a song from their newer album ‘Story of a Heart’ was adorable; the screen was covered in images of TV screens which showed clips from all their old music videos. It really was prime emotional arm-waving along material, which I adore. When at one point the band disappeared for a costume change and images of horses and cowboys came on the big screen, and then they came out wearing Wild West gear I knew exactly what was coming and again, it was an over-excited moment. Hearing ‘5, 6, 7, 8’ live was truly what dreams are made of. It transported me right back to those primary school disco’s when you’d get so hyper dancing around cowboy-style when it came on, and that’s exactly what I did. It honestly was possibly the most fun, energetic, happiest three minutes of my entire life. Quite possibly. After a long hour and a half of having the time of my life absolutely screaming at the top of my lungs, dancing around and living my best life, they sang the last song before they went off for the encore, ‘One For Sorrow’. This was truly one of the highlights of the show purely because the whole crowd was so, so into it. I mean, they were like that the entire show, but it’s like something magical happened in the room during this song. It was always one of my favourites when I was little, and so, as with all the other songs, I enthusiastically sang every single word as though I was 8 years old again. But what was so special about this song was that the ENTIRE crowd did the dance moves along with the band without even being asked or shown what to do! Granted, it was only sticking one finger up for ‘one for sorrow’ and then two for ‘it’s too, too bad’, but still. It was absolutely incredible. I don’t even know why it impressed me so much. It just did. There’s something extra special about a whole crowd of 15,000 people all doing the same dance move, singing along so loudly and you knew that everyone in that room was having the time of their life. And that’s what music does, it unites people, and that’s why I adore it so much. I guess that’s why that moment was so special for me, because it epitomised just that. I knew what the encore was going to be before they even left the stage because it was the only iconic song they hadn’t sung yet. Sure enough, when the intro music to ‘Tragedy’ came on I was not surprised, but I was still equally excited. 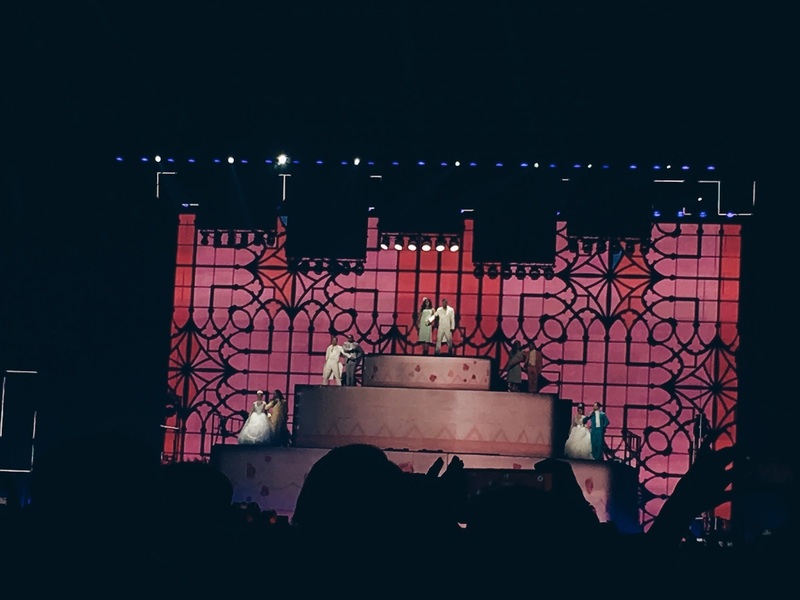 The staging was so cool, it was like a massive wedding cake and the girls were wearing wedding dresses and the guys suits. 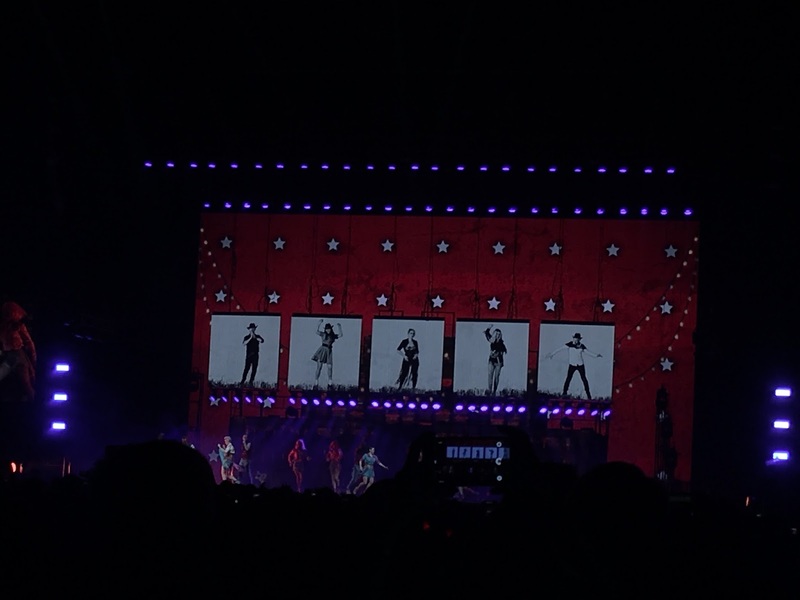 The song came with all the iconic dance moves and was everything I ever dreamed that hearing Steps live would be. It was the perfect ending to one of the most incredible shows I’d ever been to. What can I say? I hope I’ve been able to put across to you how amazing this concert was and how much I enjoyed it. That’s probably one of the reasons that this post has taken me so long to write, because I honestly didn’t know how I was going to convey in words how happy this show made me. It was hands down THE most fun show I’ve ever been to. I was having the time of my life the entire time, I was able to relive my childhood in the most incredible, enjoyable way and everyone around me was having the time of their lives too. The smile didn’t fade from my face the whole night and for a while afterwards, I honestly haven’t felt that genuinely happy in a long time. The fact that I didn’t have the best few as we were towards the back of the floor and I’m so short didn’t matter. I danced and sang and felt happy to be alive. It’s amazing how a concert can give you that feeling. I sound like I’m being dramatic right now but honestly I can’t even explain to you what a fabulous night I had. The staging was amazing, the visual effects and all the images and videos they used in the background were vibrant and fun and reflected the uplifting mood of the show perfectly. Everything was just perfectly done, their energy on stage, the fact you could tell they were so happy and thankful to be back and the nostalgic quality of the show were what made it so enjoyable. You can tell it was a good show when my mum turned to me as we were about to leave the venue and said ‘you really are at your happiest when you’re at a concert’. She couldn’t be more right. Have you been to see Steps on tour? What was the most fun show you’ve ever been to? I’d love to hear from you in the comments! Also, I have just finished my first semester of my Masters which is why I haven’t been the best at regularly posting recently! But I’m almost at 200 bloglovin followers which is amazing so thank you to every one of you who actually reads and enjoys my posts it means so much to me! And in case you were wondering from my last post, I did manage to get Taylor Swift tickets – I’m seeing her at Wembley Stadium in June and I am over the moon!